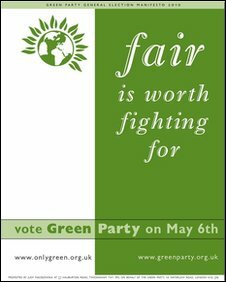 The environment, the economy and fairness are at the heart of the Green Party's manifesto. They want to make Britain a more equal society, with a million new jobs and a lower threshold for the highest rate of tax. There would also be a "living wage" of 40% more than the current national minimum wage and a boost in pension levels. Money would be reallocated to more eco-friendly projects, such as switching spending from roads to public transport, with an emphasis on sustainable energy and cutting emissions. They are fielding more candidates than ever before and say they are "very confident" their policies will earn them a seat at Westminster.